Boetema suddenly develops the ability to astrally project to other worlds, unintentionally possessing the bodies of people light years away. Inotu, her inquisitive brother with a pension for trouble, finds himself on the run after he’s caught eavesdropping on an illegal business deal between small town business tycoons and their cyborg bodyguard. When Boetema accidentally gets someone hurt while in another girl’s body, the siblings are forced to work together to solve the problems they’ve created on their planet and others. I don't read many graphic novels, but when I do I'll totally admit I pick them based on art. Afar caught my eye with its beautiful cover and upon flipping through the pages I knew I had to read it! I hadn't actually read the synopsis before I took Afar home (like I said, I choose based on art), so I was a little surprised when I realized it was about a girl who is able to astrally project during sleep. This is such a unique premise! Boetema is the heroine of this story and, while her astral projection is a big part of the book, it isn't the only major plot point. Boetema's brother lands himself in trouble while their parents are away and they set out to find somewhere new to start over. They decide to set off through the desert in search of a city of riches where they can find work for themselves and live comfortably. Its during this journey that Boetema learns to control her ability. Afar has a lot of things going for it! The art is obviously gorgeous and I thought the premise was fantastic! I love the creatures and the different worlds Boetema visits! She and her brother are also really great characters with a lot of depth for such a short book. Unfortunately, there are also some downfalls. One issue with Afar is that it jumps around in an extremely jarring way. On one page it could be daytime in Boetema's world and then on the next page she's somewhere new in a new body with no explanation. There are multiple unexplained time jumps and I just found it somewhat difficult to keep up with what was happening at times. My main complaint with this book is that it tries to be too much with too few pages. There were multiple conflicts that needed resolving and I didn't feel like they were wrapped up very well. Some questions were left entirely unanswered. Overall I enjoyed Afar! While it definitely had its high and low points, it was a great story with fantastic, diverse characters and beautiful art. With 50 more pages it could've been great! Although this book didn't make my favorites list, I'd still recommend it to YA graphic novel lovers! 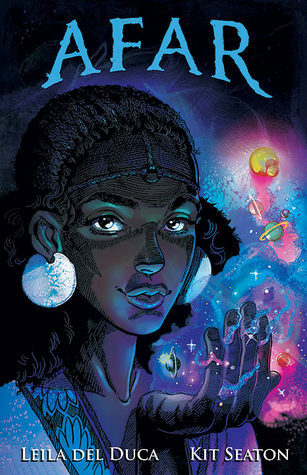 Enter to win this graphic novel on Twitter!